Moringa has been called the “Miracle Tree” and for good reason. It’s one of the top superfoods out there on par with avocado, salmon, quinoa, or turmeric just to name a few. The versatility of this plant is unparalleled given how it can be used in so many different ways for survival. If I had to choose only one kind of tree to grow in my backyard this would be it. Moringa is a tree that loves arid conditions, and many countries with such climates have been utilizing it for centuries, with great success. It has over 90 nutrients, including 8 essential amino acids that our bodies need but cannot produce on their own. It’s like vitamins are growing on this tree – B, B1, B2, B3, D, and E are all represented in large amounts. The Moringa has three times as much iron as spinach, four times the calcium of milk, four times the vitamin A found in carrots and is even higher in vitamin C than oranges! It also contains large amounts of magnesium and phosphorus. Being a powerful superfood, it has now made its way into the lives of many in the northern part of the globe as well. The U.S.A is no exception and the Moringa can be grown outdoors in many southern and western states. For the cooler states a greenhouse in your backyard will do just fine. Or you can grow it indoors. An added benefit you’ll probably love about this tree is that pests do not attack it, making it easy to grow year-round with very little expense. 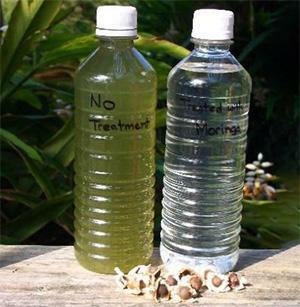 To purify your water just crush some Moringa seeds. It will remove bacteria and make it safe to drink, without any chemicals added. The seed powder can also be used as a quick and reliable method for cleaning an entire river. The powder binds with solids in the water and sinks to the bottom removing bacteria in the process. If you don’t know how much to use, just experiment with a small vessel. First you need to realize that almost every part of this tree can be eaten, from the leaves and pods all the way down to the seeds. Experts have concluded this tree could end world hunger, and in many dry places on Earth it’s already working hard to do just that. The plant can also be used as animal feed. It makes chicken eggs better tasting with a rich colored yolk, helps cattle gain weight quicker and can even increase their milk production. This is the type of feed you want for animals especially if you’re a prepper, like me, looking to get the most out of all your available resources. The leaves, have a 28% protein content, bringing them on par with milk and cheese for example, and you can choose to eat them in a variety of ways. You can bake, juice, eat raw, or steam them. Just know that the longer you cook them the more nutrients you’ll lose. 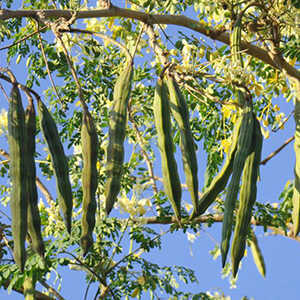 Moringa pods look similar to green beans and can be eaten in the same way as well. You can choose to steam, fry, or boil them. Like many other vegetables, you want to ensure that the pod is tender so that you won’t have to eat old, fibrous pods. These are difficult to eat and don’t taste as good. When checking the pods, snap them, and if they do so easily then they are good for eating. If not, don’t eat them as they will probably be difficult to chew. 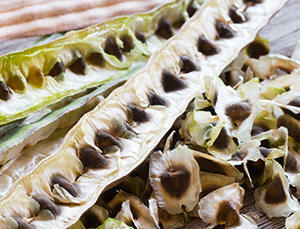 Moringa seeds can be boiled or you can sauté them. The only thing to watch out for is to not eat too much of them as they are a cleanser. It will “clean out” your digestive system which is good but only if you don’t overdo it. 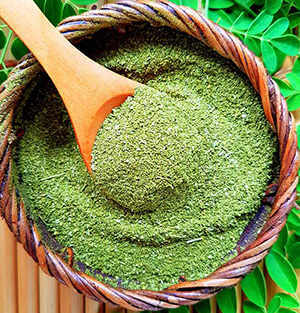 Moringa powder is a very popular form of eating this plant and it’s also the most versatile. You can add it to juices, baked goods, and pretty much any other dish you can imagine. The Moringa will help you with everything from skin health to fighting oxidative stress in the body. Only if you look at the leaves you’ll see that they contain a very high amount of a protein, large amounts of Vitamin B6, Vitamin C, Vitamin A, iron, riboflavin, and magnesium. A single serving of Moringa contains about 3 times the iron of spinach. Iron is essential to enriching the blood, carrying life, energy and oxygen into your muscles, organs and tissues. Moringa oils and fiber have a detoxifying effect to help scrub your bowel of waste and toxins allowing you to fully absorb nutrients from the foods you eat. This is vital for survival especially when food becomes scarce. High in beta carotene and vitamin A, Moringa supports healthy eyes and clear vision. The seeds contain zinc which is a necessary component in the creation of insulin inside your body. Consuming moringa seeds will give you the zinc needed to up your production of insulin and regulate your blood sugar. This will prove especially helpful for diabetics or pre-diabetics in a crisis, as their synthetic insulin supply runs out. Inflammation is how the body responds to infection or injury. It’s good for a while but if it continues it may lead to chronic health problems including heart disease and cancer. Moringa will fight body inflammation through the isothiocyanates found in its leaves, pods and seeds. Cholesterol is a huge problem nowadays and one of the main reason of heart disease. The moringa tree has been found to lower your bad cholesterol levels. The seeds of this plant contain an oil that can be used as a skin moisturizer. They also contain antioxidants and have anti-inflammatory properties, which are the building blocks of healthy looking skin. When growing moringa you basically have two options: to grow from seed or to grow from a cutting. When growing from seed you’ll want to pick a spot with some sandy and light soil. Dig a fairly big hole and add some manure. Next, place about five seeds in (not too deep) and cover them with dirt. In the end water them, but don’t overdo it as it may cause rotting. If you choose to go with using a cutting of the plant it is a little easier. Get a cutting that is about six feet long. Then dig a hole in the ground. Place the cutting in the hole and put a mixture of sand, manure. When watering, try to get it only on the ground around it and not directly on the stem of the new plant. As you can probably see by now Moringa is a very powerful plant. It has many uses and more are being discovered every year. But would Moringa make a good addition to your preps? What do you think? In his work entitled The Lost Ways, prepper and survivalist Claude Davis describes how homemade poultices made from fresh dock weed stem and leaves can be employed to prevent open-wound infections. However, the benefits don’t end here. Check out the off-grid recipe section of Davis’ book for some mind-blowing plant-based recipes.